How to play Real Racing 3 with friends? Real Racing 3 has gone wild over the last few days ever since it was released on both iOS and Android; although the game was being tested on the iOS platform earlier in 2012. What makes this game a lot more popular than other racing/simulation games is the fact that everything in the game is real. And the game graphics can be compared to high end PC games. All in all, Real Racing 3 is the best racing simulation game ever to hit the mobile platforms. The game is available as a freemium model which allows you to install and play the game for free. But to stay in the competition and advance in the game, you are required to make in-app car purchases and upgrades, which may be available as an exchange for gold coins (collected when you level-up in the game) or bought with real money. This revenue model is helping the game developers to earn more money as well as gain the majority of users worldwide. 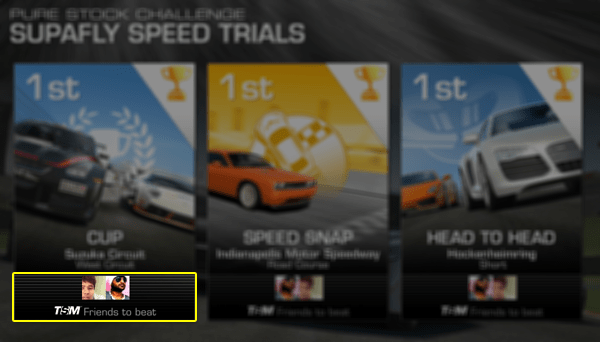 7 How to play Real Racing 3 with friends? 8 What is Time Shifted Multiplayer (TSM)? All your competitors featured in all the race events are actual people who have raced on the same track before you. This means that you are actually competing against the lap times of real players from all over the world, not just some A.I. powered robot competitors. Of course, the A.I. also plays its own part – so that the opponents don’t overlap each other’s (and your) position, responding to your pushes and hits, and so on – making the game as “real” as possible. All the tracks and locations featured in the game exist in the real world. Each circuit that you race on has been designed keeping it as close as possible to the real world circuits. The level of detail is noteworthy as well. All cars and brand names featured in Real Racing 3 actually exist in the real world too. The cars are designed with extreme precision and their interior and exterior detailing are as much close as possible with their real world counterparts. This is another striking feature of the game. Whenever you race, your acceleration, speed, brakes, even damages, everything resembles a real world scenario. In fact, the servicing to be performed after your car suffers significant damage requires you to wait till your car is ready. This can take anything between a few minutes to a few hours depending on the amount of servicing required. You may also skip the wait time in exchange of gold coins or continue racing with other cars you own. Real Racing 3 keeps you glued to the game. As you level up your driving skills by winning more races, unlock bonus races and compete with other people, you earn money and gold coins which can be spent on upgrading your owned cars or buying new ones. The more powerful your car is, the greater will be the possibility of beating your opponents. You will occasionally get special offers on car purchases and upgrades. Additionally the Store also lets you to earn money and gold coins by completing featured offers or buy them with actual money. Special racing packs are also available in Store. As long as you are offline, you will be playing with random individuals. The game downloads data whenever you are connected to the Internet while playing Real Racing 3. You can progress in the game as well as earn money and coins by winning races. But when you connect your Facebook account (or Game Center too if you are on iOS), things get a little more serious. Your friends will be able to see your rankings and compete with you along the way. Your scores and lap timings can also be uploaded to the game servers. And you even get more bonus if you are able to beat your friends. Once the game is set up, you have to login to Facebook if you want to compete against your friends. Follow these simple steps to get connected to Facebook. After getting over with the tutorials (first time only), when you are back on the Events screen (the one that lists all the races across all locations), tapping the Gear icon in the bottom left corner of the screen will draw out a list of options. Select the first option (a bigger Gear icon) to enter the Settings page. Near the top right corner, you should see a Facebook login button. Click on the login button and allow your account access to Real Racing 3. You are now ready to compete with your friends. However, you cannot play Real Racing 3 with your friends in real time. 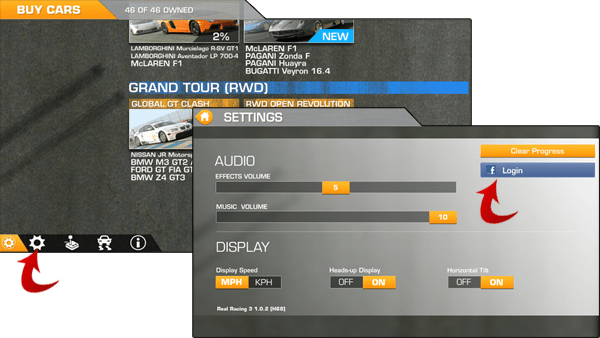 Real Racing 3 only supports Time Shifted Multiplayer; if you want to race against your friend(s) on a particular event, they should have already played the event before you and their lap time data should have been uploaded to the game servers and updated on your device. If your friends are already playing Real Racing 3, they will show up on the list of active TSM friends (left panel of the Events screen). And, in order to race your friends, first you’ll need to beat some of the worldwide racers and win a gold trophy. You can try and beat your friends in various racing events or you may set your own record for them to beat. Each event is accompanied with a “TSM Friends to beat” section that lists friends who have already set a record in that event. What is Time Shifted Multiplayer (TSM)? This is a unique feature of Real Racing 3. Although you will be racing with real world people, they would not be racing with you in real time. The opponents’ cars that you see during a race is powered by original lap times of your friends and other players (who have raced on the same track earlier) and also A.I. driven to react accordingly to present conditions. Similarly, when other players race on the same track later, they might find you as one of the opponents! Thus each opponent you meet on the racetrack is a time-shifted version of themselves. Time Shifted Multiplayer (TSM) is a new concept in gaming. And it’s being featured on a mobile game that is becoming increasingly popular everyday. Millions of users sign in and race the tracks of Real Racing 3. And the feature might not work as you expect it to. An opponent racing on a particular track might not come across the latest version of your lap time if you have raced multiple times on it. Not all friends can be competed with. Sometimes, a particular friend might not appear as an opponent in a race even though he/she had completed the same race earlier. It is not necessary that players will always compete against your fastest lap time. Your time shifted version may be from any of the attempts you have made on the particular race event. We tested the game on both iOS and Android platforms. Due to the vast variety of hardware, some Android devices have issues rendering this game. The developers are working to address these issues and some of them have been already been fixed. Here are some of the known issues of the game on Android Platform. The game is not as smooth as that on iOS. It crashes frequently on some devices. Some graphic processors are unable to display objects on the rear view mirror. There are problems with sound rendering on some devices. Additionally, the game also has significant problems while downloading game data over 3G/4G during the installation. These problems may be fixed in the future updates, but the overall experience is good enough on all Android devices with a dedicated Graphics chip. Real Racing 3 is a must try for every gaming freak out there. If you haven’t already, download the game on your iOS or Android device and begin Real Racing right away. If you are an iPhone, iPad or iPod Touch user, you can download the game for free from the App Store. The download size is pretty large, so it may take a while to get started. Similarly, Android users can also download the game from the Play Store. Don’t be surprised on seeing the small size. The actual download begins when you launch the game, where additional required files are downloaded and installed. Make sure you have enough space (1.7 GB) on your device. Download Real Racing 3 (iOS/Android).